Carbon Explorer floats, called SOLOs, are launched into the sea by Lab researchers to record temperature, salinity, circulation, and carbon biomass concentrations. Such evidence may reveal valuable information about the fate of carbon absorbed and released by the oceans. Starting in the spring of 2004, approximately 3,000 tons of carbon dioxide, compressed to a liquid, were injected nearly a mile deep into a brine-saturated aquifer that sits above an abandoned oil field near Houston. This test is the first scientific evaluation in the U.S of brine formations as underground carbon sequestration storage sites. Berkeley Lab scientists will spend about a year monitoring what happens to the carbon dioxide plume as it moves throughout the formation, displacing the brine from porous rock. And other Berkeley Lab scientists look to the oceans, which currently capture a third of the carbon put into the atmosphere — most of it from fossil fuels. Two robotic Carbon Explorer floats tracked patches of iron-fertilized plankton for weeks through the storm-tossed Southern Ocean to test the “iron hypothesis,” which proposes that adding iron to some ocean waters will make more aquatic plants bloom — thus trapping enough atmospheric carbon dioxide to offset the greenhouse effect. Around the globe, Carbon Explorers continue to gather evidence about the ultimate fate of carbon absorbed and released by the oceans. Scientists at the National Center for Atmospheric Research used the computing power of NERSC to extend the Parallel Climate Model (PCM) run to nearly 1,500 years, part of a set of experiments that represents the most extensive 20th century climate simulations ever attempted. 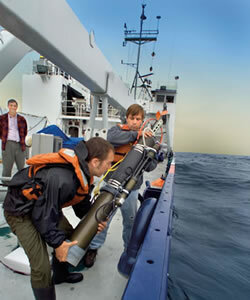 In this image, the PCM simulates the sea surface height (in centimeters) and ocean currents in the North Atlantic Ocean. To better understand the impacts of climate change, scientists from the National Center for Atmospheric Research recently completed a 1,000-year run of a powerful new climate-system model at Berkeley Lab’s National Energy Research Scientific Computing Center (NERSC). The scientists ran the simulation for more than 200 uninterrupted days on NERSC’s Seaborg supercomputer. Accurately predicting global climate change demands complex and comprehensive computer simulation codes, the fastest supercomputers available, and the ability to run those simulations long enough to model century after century of the global climate. Efficient energy use is another Berkeley Lab research cornerstone. Scientists here developed the next generation of energy-efficient windows called transition-metal switchable mirrors, which are glass panels with a coating capable of switching back and forth between transparent and reflective states. Controlling the flow of solar radiation through windows has already saved billions of dollars in energy costs — an estimated $8 billion through the year 2000. Berkeley Lab’s new window technology could increase savings even more. Other scientists are developing building energy simulation software, creating efficient lighting technologies, and fine-tuning ventilation systems.